Because I resigned the lease on my apartment this year and didn't move, I promised myself a lovely little apartment makeover last month. Obviously, it hasn't happened yet because I've been so busy with work and adjusting to being on my own (financially). However, things are slowing down and I'm finally getting adjusted to financial independence, so I'm planning my redecorating mission! I've featured Evelyn Hensen and her designs on my blog a few times now, but when I saw her Flirty Florals No. 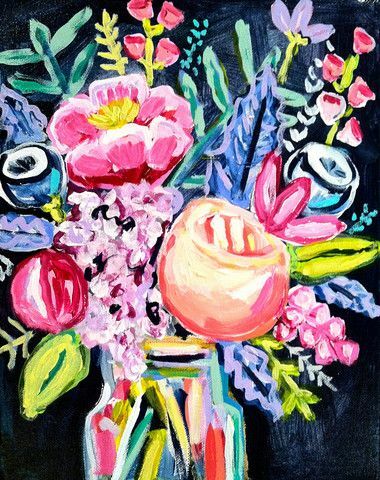 2 painting on her website, I instantly fell in love. I love that it's fun and girly yet semi-muted enough to be considered "gender neutral" for my boyfriend. Hopefully he approves and this gorgeous painting will be hung in our home! View more of Evelyn's stunning paintings and prints on her website! That painting is absolutely stunning, love all the colors!